Consider this scenario. Imagine the government decides to feed some money into the economy, so it calls up the Bank of England and requests, say, £10 billion. The Bank of England prints £10 billion’s worth of notes like this one, and gives them to the government in exchange for £10 billion’s worth of government bonds, which are like a promise that the money is owed back – also known as a debt. So, just in case that went right over your head, the government wants £10 billion; it essentially borrows £10 billon from the Bank of England, creating a debt. It then takes its shiny new £10 billion and puts it in a big bank account – this is where that money becomes legal tender, adding £10 billion to the money supply. It’s pretty much that simple. 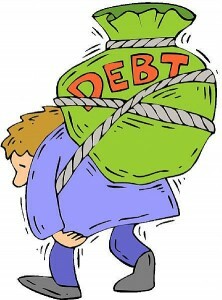 But the important thing here is that that money can only be created by also creating a debt, and debts must be repaid. But hang on, why did we create that money? We created that money because there is a need for it – the population needs money to spend and trade with. Consider this idea that money – and hence debt – can be created just because there is a need for it or just because a need has been created for it. This idea was responsible for the financial collapse we have witnessed in recent years. Once upon a time I could have taken this £10 note to the Bank of England and exchanged it for an amount of gold of equivalent value. 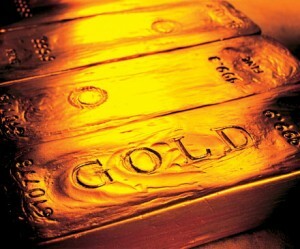 Gold is something tangible, with intrinsic precious value. And the word ‘pound’ actually comes from a time when money represented a weight of precious metal. The concept of paper money came along when people got tired of carrying pounds and ounces of coins around with them for large transactions, instead choosing to trade using official pieces of paper that represented weights of precious metals used as currency. That Gold Standard was suspended in 1914. Even though this note still bears this promise that the Bank of England will give me £10 for it, I can’t go there and exchange it for gold anymore; instead this note is only worth what it buys. It’s actually – look at it – it’s a worthless piece of old rag, it’s torn, it’s useless – I can’t mop up spills with it, I can’t eat it, I can’t burn it for any useful heat energy, I can’t trim my beard with it – I can’t use it for anything practical at all. It bears some pretty impressive official designs on it, but those are just to prevent counterfeiting, and, of course, it bears an image of the Queen, but what gives it value is none of that – rather it’s the recognition by people of what it is worth at a particular time. And you probably have a good idea of what £10 can buy you right now, but the bad news is that, with inflation, where the cost of everything slowly increases, what this note here is worth – what it buys – is decreasing all the time. In fact, this note here, I worked out, will lose 0.0001% of its value between now and when I finish speaking in a few minutes. So what causes inflation? Well, think about gold again. Gold is precious because it is comparatively rare. It’s a precious metal – it looks good! But it’s rare, and that makes it valuable. If a huge amount of gold was suddenly discovered, the value of all gold around the world would decrease – because there’s more gold to share around. It’s the same with money. The amount of money in the world doesn’t actually remain constant. Remember that £10 billion we created? Well that needs to be paid back to the Bank of England. And as we all know, debt comes with interest, so they actually have to pay back more than £10 billion. 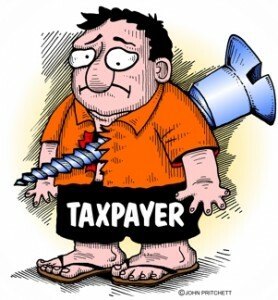 That extra money has to come from somewhere – and it comes mainly from us – the taxpayer. But we have personal loans, and people have small and large business loans – there’s loans everywhere – loans make the economy tick – and all these loans have to be paid back along with interest. We have to make the extra money to pay our interest by making profit from each other – through business and trade. But think about that – how can everyone make profit? How can everyone’s account balance go up? Well, it can’t, unless we actually make – create – new money and feed it into circulation! This is what happens. The amount of money in circulation has to be constantly increased to service all these loans which drive our ‘economy’ – and all that new money that’s created steals value from the money that is already in circulation – hence causing inflation. And because of this – and this really will mess with your mind – if, this afternoon, say, everybody in the world tried to pay back all the loans in existence, there wouldn’t be enough money to pay them all back. There is more debt than money. And this means our society can never be debt-free. Well that began in 2008 and it continues. In the boom before the bust, banks thought they were making huge profit by creating more and more and more debts. Sub-prime mortgages were a commonly cited example of banks going to absurd lengths to create as much debt as possible – to make as much money as possible. But the crash occurred because the behaviour of the banks – the greed – was so extreme that the balance was tipped too far, and the debtors didn’t have enough money to even begin paying off their loans. But the idea that greed, on its own, caused the financial crisis by causing the bankers to behave selfishly, is a short-sighted idea, a dangerous idea because it propagates the assumption that somehow humans are genetically programmed to be greedy. And this is simply not true. Has anybody ever been accused of being greedy for breathing too much air? No. Air is abundant. It’s everywhere – there is more than enough air to go around. When resources are abundant, we are free to take as much as we like. But when resources are scarce, they have to be bought, or fought over, and if someone happens to fall upon an opportunity to take more than their fair share, they will take that opportunity. And they can’t be blamed for that behaviour – for a start, the monetary system rewards them for being greedy, but what if they actually do end up needing more than they originally thought? or their family ends up needing more than they thought, or they just desire the rare luxury that the extra will provide? We call this behaviour greed, but it’s an animal instinct to take as much as you can, because your survival may depend upon it. It is not human nature to be greedy. 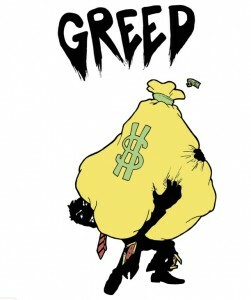 Greed is simply an instinctive reaction to circumstances of scarcity. People are greedy and selfish with money because money is scarce. We do need more and more money to survive. But as humans – not just animals – we have the gift of choice. We can choose not to be greedy. Our monetary system has been useful – with it, we have progressed by amounts unimaginable to people only a couple of centuries ago – but it’s a dead end, because this system relies on scarcity of energy, scarcity of clothes, scarcity of food, scarcity of fresh water. We might think we are benefiting from money – we can afford not only to survive but a few luxuries too – but in the longer term the Earth is suffering. Manufacturers are persuaded to cut corners and produce goods as cheaply as possible, regardless of the social or environmental cost. Many of humanity’s activities are unsustainable. Unrecyclable plastic bottles of pop. Oil burning cars. If we continue to enjoy being wealthy in an unsustainable, separatist society, our days are numbered. But there’s an alternative future. As automated, sustainable technology and renewable energy reach new frontiers, these commodities can and will become less scarce – clothes and food and fresh water and energy and luxuries could become abundant for everyone in the world – not just for a few. Less scarcity means less greed. I believe we can move towards that future within our lifetimes. Greed caused the financial crisis – but let’s not forget that it’s the economic system that presents the underlying problem. And whilst we allow greed to run our society, humanity is going nowhere fast. So, a thought for all of us: let’s aim for that alternative future; let us begin by avoiding greed today. For if enough people are sufficiently generous and selfless in their daily choices, humans will progress to a more sustainable and more enjoyable – a fair – world society, where, instead of scarcity, it’s abundance that rules the world. (When we were born,) we brought nothing into the world, and (when we die) we (will) take nothing (physical) out of it. 8 But if we have food and clothing, we will be content with that. 9Those who want to get rich fall into temptation and a trap and into many foolish and harmful desires that plunge people into ruin and destruction. 10 For the love of money is a root of all kinds of evil. Nice summary of the system and how it works, good to see you’re still a student in these issues. I imagine this will come as news to most of the people listening.